Links to this page can be found in Book 7, Map C3, Day 7, View C8, Rione Sant'Eustachio, Rione Sant'Angelo and Rione Regola. This 1756 etching by Giuseppe Vasi shows a corner of XVIIIth century Rome which was characterized by the presence of small workshops which were grouped together according to their trade. The large street in the foreground led to Campo dei Fiori and it was named after the giubbonari (jacket makers), that leading to Palazzo Mattei after the falegnami (carpenters/joiners) and that at the right end of the etching after the catinari, makers of low terracotta basins, one of whom is shown at work in the lower left corner of the plate. A reference to this trade was added to the name of the imposing church dedicated to St. Charles Borromeo to distinguish it from S. Carlo al Corso and S. Carlo alle Quattro Fontane which were built at a slightly later time. The view is taken from the green dot in the 1748 map below. 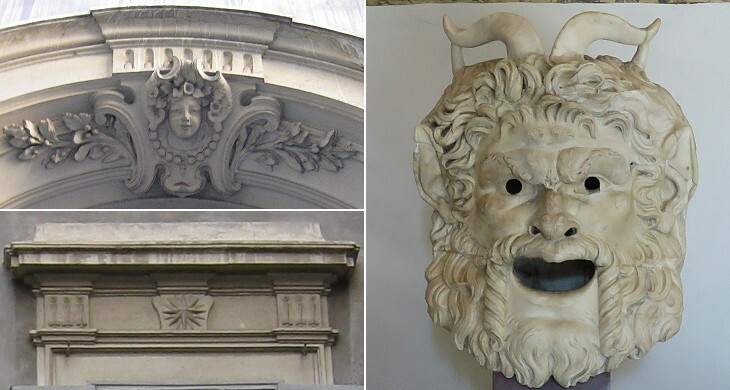 In the description below the plate Vasi made reference to: 1) S. Carlo ai Catinari; 2) Monastero delle Monache di S. Anna; 3) Strada dei falegnami; 4) Street leading to Piazza Giudia; 5) Palazzo Mattei. 5) is shown in another page. The small map shows also 6) Palazzo Santacroce; 7) Palazzo Boccapaduli; 8) Chiesa di Gesù Nazzareno; 9) Palazzo Cavallerini; a red asterisk indicates S. Anna dei Falegnami and a blue asterisk S. Elena dei Credenzieri. The dotted line in the small map delineates the borders among Rione Sant'Eustachio (top left quarter), Rione Pigna (top right quarter), Rione Regola (lower left quarter) and Rione Sant'Angelo (lower right quarter). In 1887-888 Via Arenula, a large street, was opened to link the centre of Rome with Trastevere via Ponte Giuseppe Garibaldi. Monastero di S. Anna and its church were pulled down and also S. Elena dei Credenzieri which stood behind them was demolished; this small church belonged to the guild of the butlers of cardinals and noble families. In the XVIth century the act of credenza was the tasting of food and drinks by a servant for his master. 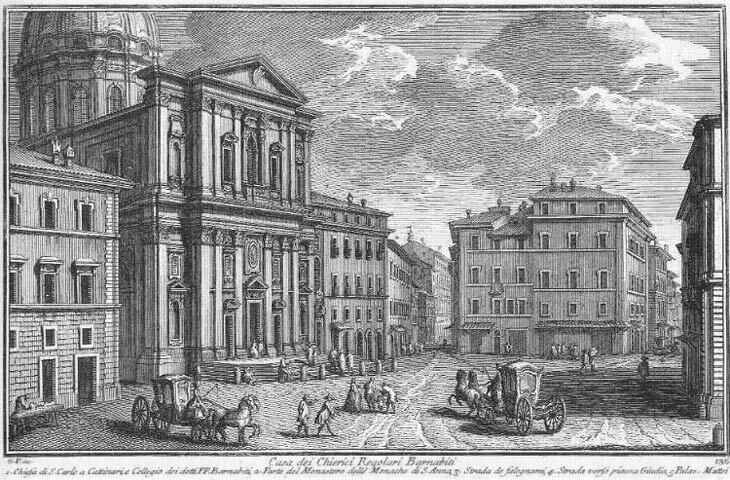 S. Carlo ai Catinari was built by the Barnabites, a religious order named after the church of S. Barnaba in Milan, where its first members used to meet; the Barnabites, similar to many other orders founded in the XVIth century advocated a more severe lifestyle; for this they faced suspicion of heresy; Cardinal Borromeo protected them and in 1579 he contributed to the definition of rules which, while keeping to the initial aim of the order, were in line with the teachings of the Roman Church. 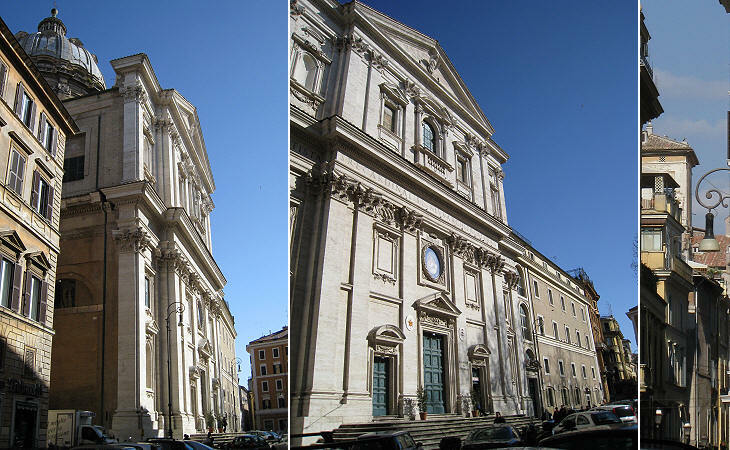 In Rome the Barnabites were assigned S. Biagio dell'Anello, a small church on the site of today's S. Carlo ai Catinari; the new church was founded in 1611 and because Cardinal Borromeo had been canonized in the previous year it was dedicated to him. By 1620 the church was completed with the exception of the decoration of the façade and of the apse. 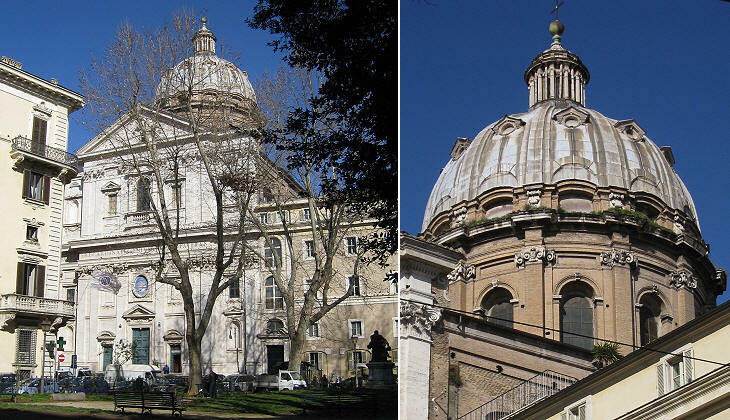 It has a Greek cross shape with short arms so that the dome is clearly visible from the street (similar to the original design of S. Pietro). The completion of the church was halted for a few years by a lack of financial resources; this situation was modified in 1627 by a bequest from Cardinal Giovanni Battista Leni, a cousin of Cardinal Scipione Caffarelli Borghese; the façade was designed in 1636-638 by Giovan Battista Soria, who often worked for Cardinal Borghese, and the interior was decorated with paintings and marbles. 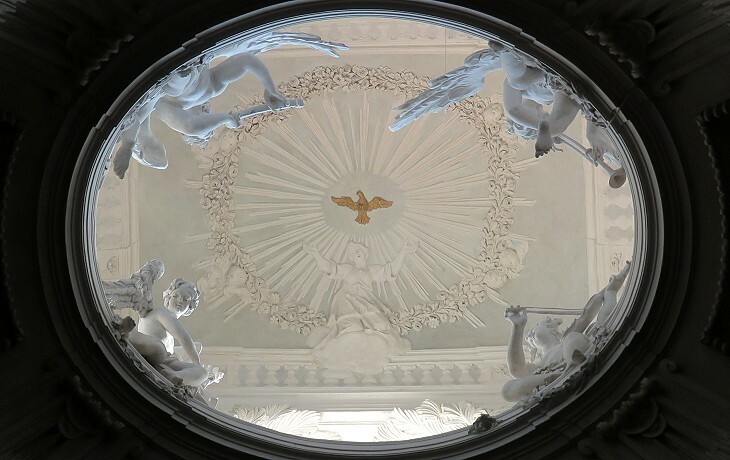 The church was designed by Rosato Rosati, an architect whom is known only for his involvement at S. Carlo ai Catinari and for S. Giovanni at Macerata, his hometown. The drum of the dome has twelve windows and twelve other small windows are above them. Eight of the latter were closed to strengthen the structure of the dome. Domenico Zampieri, nicknamed il Domenichino for his small stature, was one of the leading painters of the early XVIIth century; his fame declined in the XIXth century, but until then travellers to Rome did not forego seeing his large frescoes at S. Andrea della Valle and at Grottaferrata. 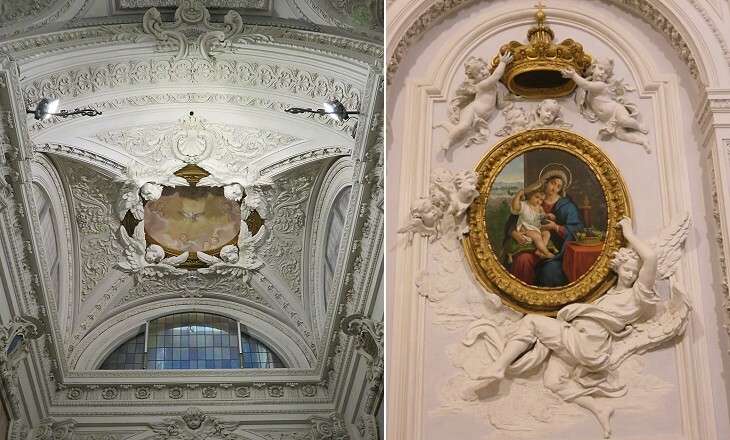 His pendentives at S. Carlo ai Catinari are one of his last works, which was commissioned by Cardinal Borghese. In some areas the paintings expand beyond their frames. This "trick" eventually became a feature of many illusionistic ceilings of the end of the XVIIth century. In the portrait of Justice Domenichino departed from the traditional iconography which depicted Justice as a blindfolded woman (a relatively easy task for him) and he showed his talent by painting the blank stare of a blind woman. Antonio Gherardi (1644-1702) was a painter who acquired a great reputation for his frescoes in the ceiling of S. Maria in Trivio. In 1695 he was commissioned the design and decoration of a chapel dedicated to St. Cecilia, patron saint of the musicians. 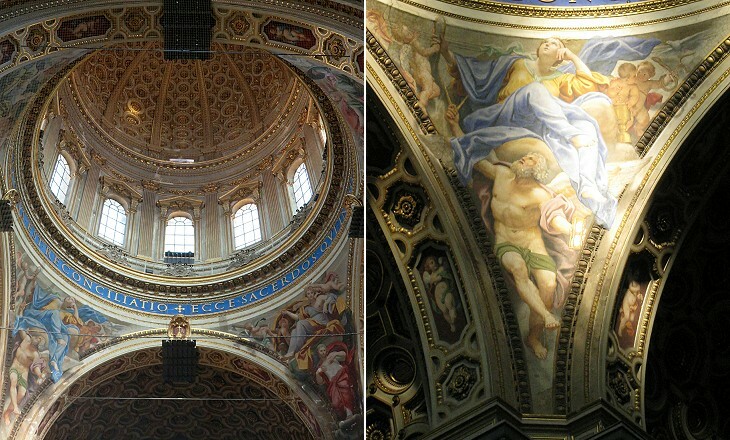 While his large painting above the altar is rather academic, the architecture and the stuccoes decorating the vault of the chapel are an excellent addition to those designed by Gian Lorenzo Bernini and his assistants at S. Andrea al Quirinale a few years earlier. The plate shows to the far right the street leading to Piazza Giudia. 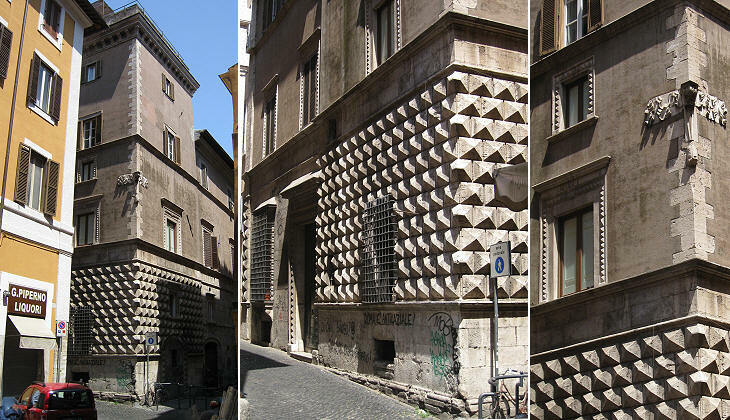 The second building to the left in this street is Palazzo Santacroce a Sant'Angelo (a larger Palazzo Santacroce is opposite S. Carlo ai Catinari); its decoration, which is reminiscent of Palazzo dei Diamanti in Ferrara (it opens in another window) is unique in Rome. The two palaces were built at the same time towards the end of the XVth century. The Santacroce were involved in a long feud with the Margani, another turbulent family of this neighbourhood. It is said that the palace shown above was built on a previous house of the Santacroce which was razed to the ground by order of Pope Sixtus IV as a form of punishment for their behaviour. Many members of the family are buried in nearby S. Maria in Publicolis. In the late XVth century they acquired the fiefdom of Vejano. In 1555 Pope Paul IV issued a decree which forced the Jews living in the Papal States to relocate to a restricted area (ghetto) either in Rome or in Ancona. The southern part of Rione Sant'Angelo, the area selected for the Roman ghetto had a mixed population, both from a religious and a social viewpoint. 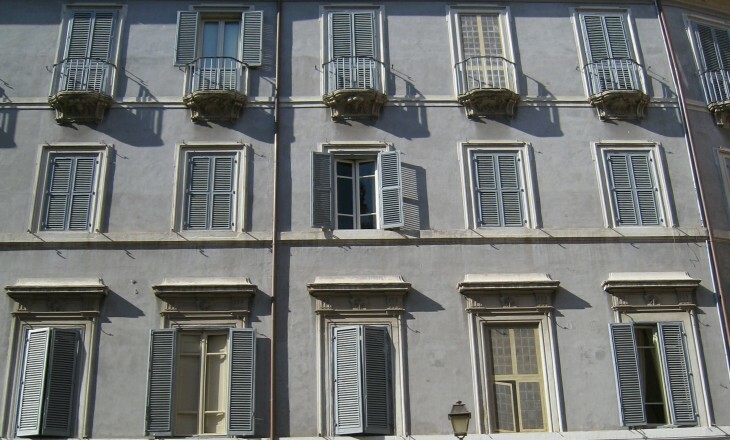 The Boccapaduli, a very ancient Roman family, left their houses which were situated in the ghetto and they bought a palace immediately outside it in Via de' Falegnami. The palace was subsequently enlarged and what we see now is mainly an XVIIIth century building. In 1560 the barbers' guild was assigned a small church dedicated to SS. Trinità. The barbers renamed the church which was dedicated to Sts. Cosma e Damiano (two saints of the IVth century from Aegea, medieval Laiazzo and today's Yumurtalik, who had healing powers). A larger church was already dedicated to them in Campo Vaccino. In 1722-724 the church was almost completely rebuilt (the architect is unknown). In 1888 it was assigned to Confraternita (brotherhood) di Gesù Nazzareno and it was renamed again. You may wish to see a directory of churches belonging to a guild. In 2010 a careful restoration brought the interior of the church back to its original appearance, or perhaps to one it never actually had. 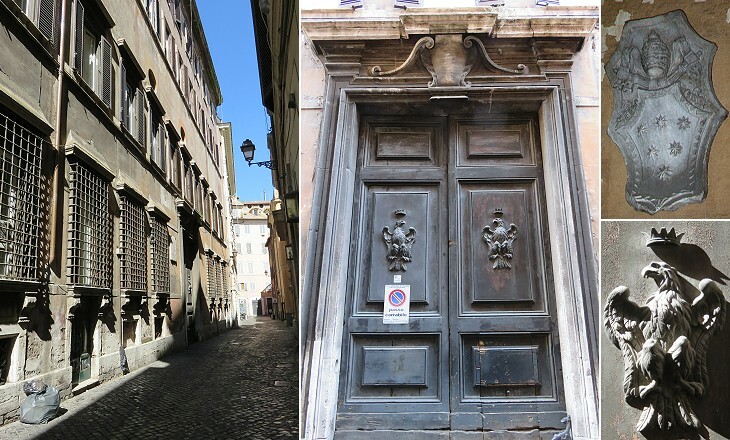 A long building opposite the church is currently poorly maintained; a glance through the large portal reveals a coat of arms of Pope Clement X, who was the ruling pope in 1676 when Giovan Giacomo Cavallerini built this palace, still named after him. He was appointed cardinal in 1695. Next plate in Book 7: S. Maria in Vallicella. 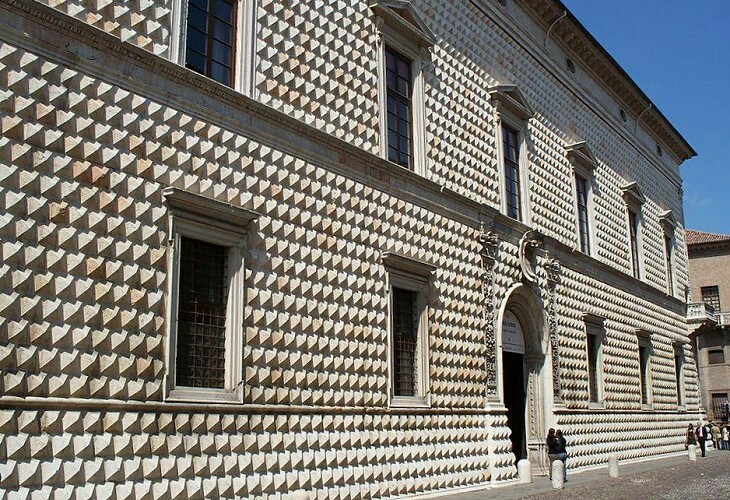 Next step in Day 7 itinerary: Palazzo Pio. You have completed your tour of Rione Sant'Angelo! You have completed your tour of Rione Regola! 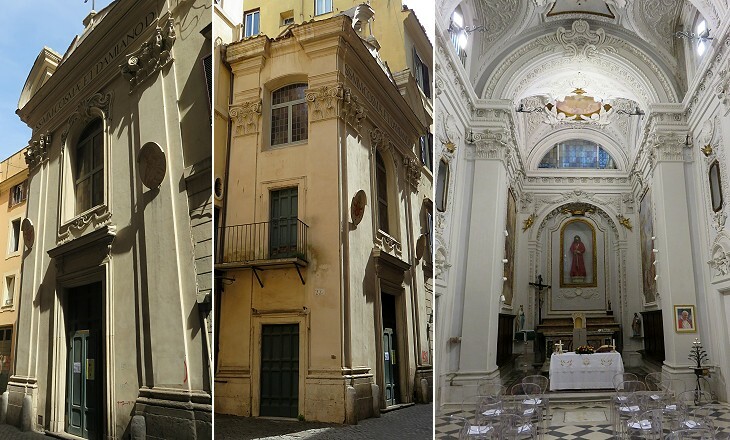 Start your tour of Rione Sant'Eustachio; next step: S. Maria in Publicolis. Apparteneva questa chiesa ai Cavalieri Templari, e chiamavasi allora s. Maria in Giulia; ottenuta poi l'anno 1297. dalle monache Benedettine, che stavano appresso la chiesa di s. Gio: Calibita, la rinnovarono in bella forma l'anno 1675. , e perchè queste monache conservano l'anello di s. Anna madre della ss. Vergine, le posero il titolo della medesima, e dicesi ai Funari. L'altare maggiore è tutto ornato di preziosi marmi secondo il disegno del Cav. 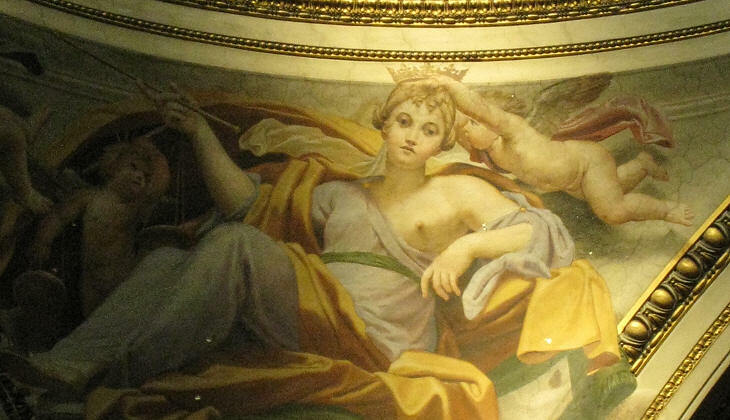 Rainaldi; il quadro di s. Anna nell'altare a destra è del Cavarozzi, ed il s. Benedetto incontro del Savonazzi, le pitture però sulla volta sono graziose opere di Giuseppe Passeri. Nelle cantine del monastero si vedono varj muri antichi con archi, e pavimenti di mosaico, quali si credono essere residui di bagni privati. Prese un tal nome questa magnifica chiesa dagli artisti, che in questa contrada lavoravano certi vasi di legno, chiamati catini, e fu edificata insieme colla casa de' Chierici Regolari Barnabiti dal Card. Gio: Batista Leni in occasione, che que' religiosi quì presso avevano una piccola chiesa detta s. Biagio dell' Anello, per l'anello, che vi si conservava di detto Santo, atterrata per dar luogo all'abitazione de' Chierici Teatini, e per un grande incendio quivi seguito: onde su quelle rovine nell'anno seguente 1612. fu piantata la chiesa con disegno di Rosato Rosati, il prospetto però è del Soria. E' ornata di bellissimi altari di marmo, e di pitture celebri; il quadro del s. Carlo nell'altare maggiore è opera di Pietro da Cortona, le pitture a fresco nella tribuna sono del Lanfranco dipinte in tempo della sua vecchiaia, e quelle negli angoli della cupola sono del Domenichino similmente delle ultime sue opere, il Dio Padre però nel cupolino è di Gio: Giacomo Semenza allievo di Guido. Il quadro nella cappella, che segue è del Romanelli, e quello incontro con s Cecilia, di Antonio Gherardi; la s. Anna nella crociata è di Andrea Sacchi, ed il s. Bartolommeo incontro di Giacinto Brandi; la ss. Nunziata però nella cappella laterale è del suddetto Lanfranco.